After a lot of thought I have decided to start a new blog. I just don't feel like Mrs. Mama anymore. It is just hard even coming to this space. If you would like to continue following our story you can click here. The blog is still in the early stages and I erally like it that way. It feels good to be back at the basics, raw even. I like it. Jack was awful Halloween night. I'm talking awful!!! I pleaded with him. I pleaded with God. I even went through the 5 stages of grief before I gave in and went home. Our first stop was my Grandmothers. He was getting into everything. He literally pulled her oxygen out. Although it was cold outside, I was sweating. After about ten minutes of chasing his, taking things from him, and saying no continuously I had enough. Next up was the church festival. Jack saw the bouncy house first and I had never seen him so excited. The man running it was nervous about a tiny Jack getting in and I assured him that he could hold his own. He loved it! It turned out to be the best part of our whole night. I wrangled him out so we could do a little trunk or treating. Well Mr. Jack wasn't down with it. He wanted to run free. I had to hold onto him as he fought me and threw himself to the ground. Lovely! All the other children are having a wonderful time and my child is having a meltdown because I won't let him run into traffic. After he threw his bucket of candy with four pieces in it for the tenth time and a man walked by passing out a Parenting magazine that didn't fit anywhere so I was forced to hold it, Jack, and his bucket. I teared up and left. I was ready to call it a night but I just couldn't. 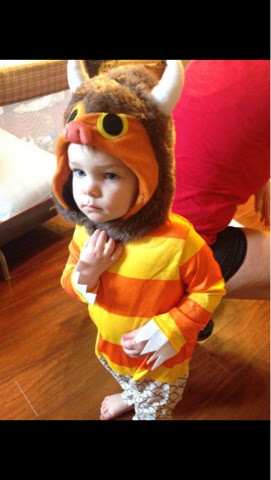 I had spent 40 bucks on that costume and by God I hadn't had that precious moment yet. I should have called it a night. Jack continued to try and run away as we tried to maneuver around cars and a darkening sky. He would just throw himself to the ground if I tried to hold onto him. I was sweating yet it was in the 40's. I lost my phone. It hit me quick and I knew it was gone. During all the craziness it had been dropped. Of course, I was angry with myself for even having it on me. My Mom has promised me that next Halloween will be easier but for now I say boo to Halloween!